School safety has been and will continue to be a consideration for the Milton-Union School District. We have been very fortunate to establish long-standing, positive relationships with both the West Milton Police Department and Miami County Sheriff's Office. Serving the Village of West Milton and surrounding communities, the district has truly benefited from the expertise of both law enforcement entities in an ongoing effort to promote student safety and security. On a regular basis, representatives of the West Milton Police Department and Miami County Sheriff's Office have been involved in the development and revision of building safety, security, and emergency plans, and representatives from both agencies have often been on-site as district personnel plan for, conduct, and debrief safety and security drills. For the past several school years, the district has also partnered with the Sheriff's Office for the services of a part-time School Resource Officer (SRO) - a wonderful resource provided to strengthen the connection between law enforcement and education including, but not limited to, the purposeful development of positive relationships with school staff members, parents, guardians, and students. Beginning again in mid-January, Milton-Union Schools will welcome Deputy Warren Edmondson to the district as our part-time School Resource Officer. With the beginning of the 2018-19 school year, Milton-Union Schools established yet another partnership with G2G Solutions to assist in supervision and further promote safety. Along with ongoing support from the West Milton Police Department and Miami County Sheriff's Office, the district has enjoyed having a School Safety Officer (SSO) from G2G Solutions in the district on a daily basis to help foster safety and security. We expect this to continue as we move into 2019. The district has also partnered with G2G Solutions in conducting a safety and security assessment of facilities and grounds so that we might best identify and consider improvements. Once again, school safety remains an ongoing consideration, and for the past several months, school and community personnel and partners have been planning strategies to help increase the presence of law enforcement and/or private safety officers in our buildings. 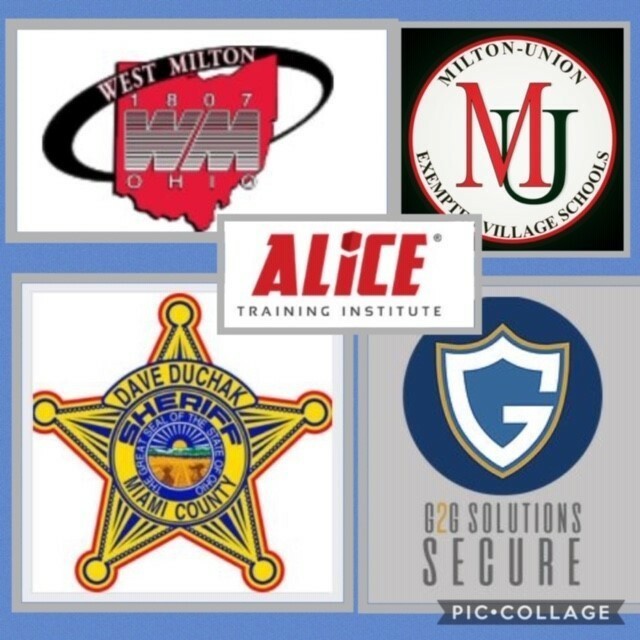 In terms of education and awareness, the district and school employees are taking steps for organizational credentialing through ALICE, a protocol designed to prepare individuals for the possibility of a threatening or aggressive intruder. As a district, we want our children to recognize that help, support, and expertise may stem from a variety of organizations and personnel groups designed and established to first promote safety.